Text messaging is one of the things that we use to communicate with each other. Most of the time, many important messages or information are sent via SMS. There are many cases where we need to use our messages in our daily life. For example, we can use it as lawful evidence. Thus, we need to backup these important messages either on your computer or anywhere else you want to save them. 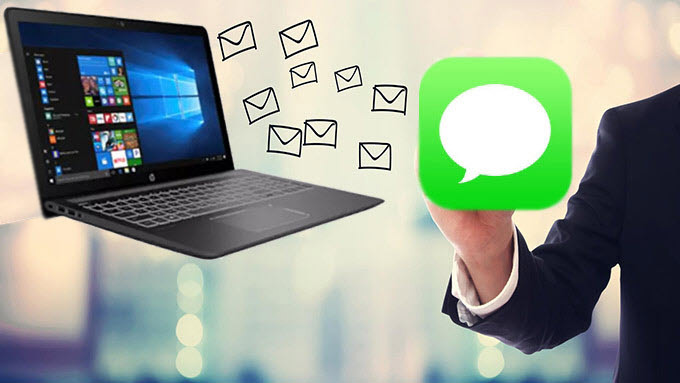 With that, here we provide different methods for you to transfer text messages from iPhone to PC. ApowerManager is a professional desktop application which lets you manage your phone files on the computer. You can import, export, delete and backup images, videos, music, documents, and contacts. Aside from that, you can also backup your messages. What’s good about this app is that all files are organized by tabs so you don’t need to dig into all the files on your iPhone. When you use this app, there is no need to worry about losing your important text messages. You can directly save them to your computer. To transfer text messages from iPhone to the computer, simply follow these steps. Download the app on your PC and then launch it. Connect your iPhone to the computer using a USB cable. Wait for the app to detect it and ensure that it’s connected. Once connected, go to “Manage” and “Messages” and you’ll find all the messages on your iPhone. Choose the messages that you want to backup and then click the “Export” button. The messages will then be saved on your computer. Apart from transferring your text messages from phone to PC, you can also use it to transfer WhatsApp Media to PC. 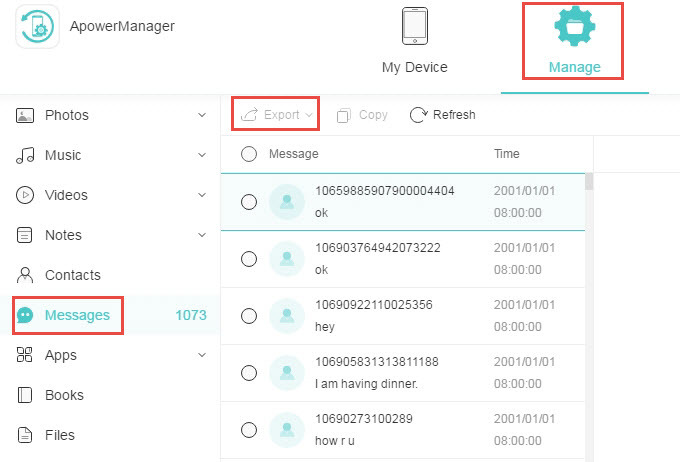 Besides, this app is capable of mirroring your phone screen to PC or Mac, taking a screenshot of your phone’s screen, or recording the activity on your phone screen. Recording your screen is helpful when you make a game demo, while screen mirroring is great for presentations. Download and install this tool on your computer. Connect iPhone to the computer and you’ll see Device Overview, choose “Data > Messages” to access all the messages on your phone. On the left column, after locating the name of iPhone, click on “Backup > Messages.” You will then be directed to your conversations. Click the message that you want to backup and then export them. If you think you’re not that techy to do the above methods, you can just use the screenshot-email method to save text messages from iPhone to computer. You will just need to screenshot the text messages on your phone and send it to your email. From your email, you can download them directly to your computer. With the following method, you can save text messages from iPhone to computer. The first thing that you need to do is to go to the text message that you want to save and hold down the “Home” and “Lock/Unlock” buttons simultaneously. A screenshot will then be taken and saved in “Photos.” Now go to “Photos”, look for the “Screenshot” folder and open it. Choose the screenshots you just took and click the forward button on the left bottom part of the phone. Forward it via email and send to your email account. Check your email on the computer and download the file there. 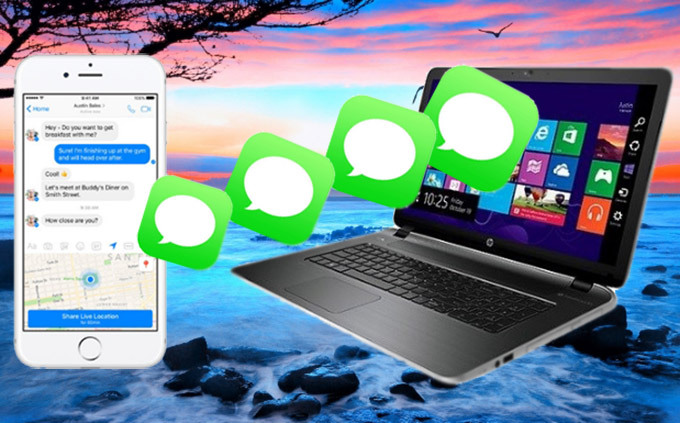 That sums up the three best ways on how you can transfer SMS from iPhone to PC. They are all helpful in backing up important text messages. However, if you’re looking for the most convenient way with other helpful features, ApowerManager is the best tool to use.